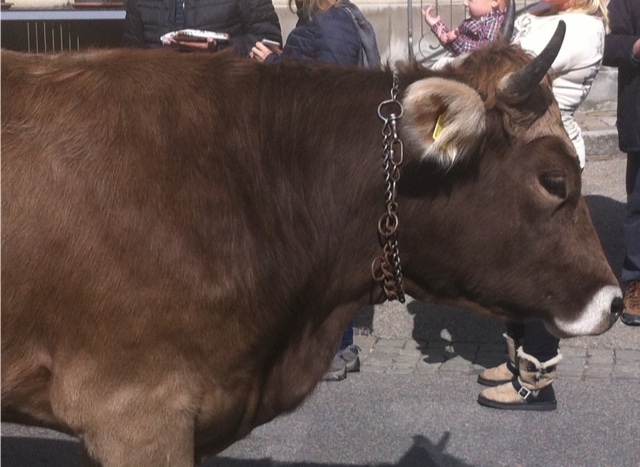 The level of noise rose as the spectators anticipated the beginning of the big race at the Autumn Farmers Market in Urnäsch, Switzerland. Earlier many of us had scoped out the competition weighing the heft, girth, leg length, energy level, and the general overall health of the racing animals before we placed our bets on our chosen winner. Our fleet footed pick was the lively #3. The gates opened and out waddled the portly porkers to navigate the (easy) obstacle course. The good natured crowd urged on the swift swines who jumped (really stepped) over two separate obstacles in the short course. I had placed myself at the strategic bottleneck of the track that was to determine the outcome of the race. We laughed and urged on all of the sweet sows and hulky hogs. And to top off the rapid race our #3 pig won! Bravo to Switzerlands swift swines! She was a vision of loveliness. Her large brown eyes graced with long lashes contrasted with her strong legs and slender ankles. But she was just one of the many bovine beauties we had come to admire. 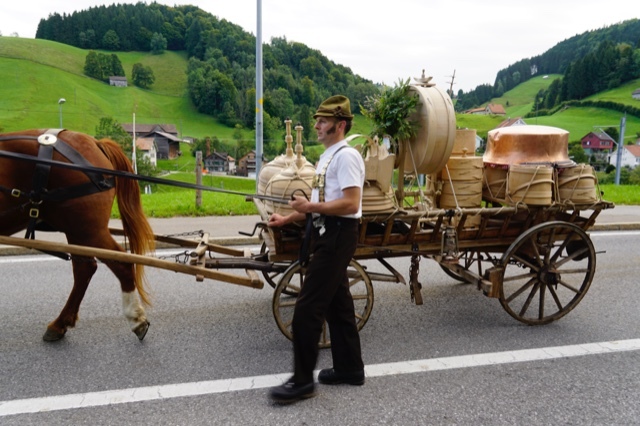 Franz and I had travelled to the Alpabfahrt & Farmers Market in Urnäsch, Switzerland to welcome home the cows and white goats from the high alpine pastures after a summer of producing milk to make the delicious cheese the region is known for. Farmers in their traditional dress led their herds through town amid the clanging cow bells and a brass band playing. The market had a festival atmosphere with various booths displaying regional specialities such as mountain cheeses, cakes, soaps, ceramics and other local delights. For lunch we enjoyed sharp raclette and a dumpling dish called schupfnudeln. What a way to celebrate the coming of the plentiful fall season.